While organizations and the leaders that run them value successful performance, successful performance is not enough. In order for this performance to have a lasting impact, the ultimate value lies in the ability to sustain results. This makes sure that once organizational/leadership gaps are closed they remain closed. 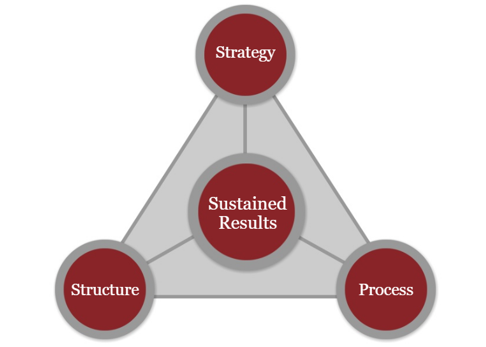 From OrgLeader’s perspective, three elements deliver sustained results. These elements are strategy, structure and process. A client organization that was gaining market share realized it needed a way to guarantee it had leaders that could perpetuate the company’s growth over time. Therefore, OrgLeader partnered with the company to build a succession management process that would cultivate an ongoing pipeline of talent. Although a forward-thinking corporation knew it needed talent management systems to support its performance over time, it lacked a component that could help to align the systems. OrgLeader constructed a custom competency framework to use as the foundation for the talent management system that included hiring, development and succession management. An executive team realized that its discussions always focused on the short term, and crucial decisions were not being made. Consequently, OrgLeader designed and facilitated executive off-sites to determine strategic objectives for the company.